“Already seen in Paris but still good,” reads one comment in the oversized visitors’ book at the Johannesburg Art Gallery (JAG). But never mind Paris. The point with this particular show was not where it had been but where it is: Johannesburg, South Africa. Over the last decade, a growing appetite for contemporary African art has spurred a number of blockbuster survey shows in cultural capitals around the world. Each claimed to provide a unique barometer of artistic production on the African continent. But only the latest, "Africa Remix," holds the trump card: it actually made it to an African audience—in Johannesburg, to be precise. This show of 83 artists from 25 African countries and the diaspora is the first major exhibition of contemporary African art held in Africa, according to JAG head Clive Kellner. “Given that exhibitions such as 'Africa Remix' are only ever seen in Europe or the U.S., our intention was to bring the exhibition, which is about Africa, to Africa for a local audience to engage with,” he said. It is obviously difficult to please everyone. A visitor disgruntled about the “pathetic little dribble of cream” in his cappuccino at the gallery café complained bitterly that such poor service would never be tolerated at the Louvre. But the "Africa Remix" visitors’ book is a litany of superlatives. “What resonates is the idea that ‘Africa Remix’ has come home,” said Stephen Hobbs of the Johannesburg art collective The Trinity Session at a recent "Africa Remix" discussion forum. Kellner hopes the show will affect perceptions around African art—“even at home.” One JAG visitor who had also seen the London iteration said it felt somehow different viewing "Africa Remix" in Johannesburg: “Here we are looking at Africa from the inside; in London, we were looking in from the outside.” But it seems the same ‘looking’ has drawn different conclusions. There are still notions of Africa being “exotic” in some of the exhibition’s prior host cities, as Kellner put it. He cited the proclaimed shock of one London critic at seeing video and digital installation on "Africa Remix." “Somehow there still remains a notion that contemporary African artists should not make work that comprises new media—that authentic African artists only produce things with their hands, like paintings and sculpture … This is really a shocking comment in the 21st century [that] a European critic could expect African artists to re-enforce an essentialist stereotypical idea of African artists as tribal, crafters or primitive,” Kellner said. The artworks in "Africa Remix" form a disparate collection linked only by theme: identity and history, body and soul, city and land. There is a slight nod to more "traditional" modes of production—an assemblage of recycled materials, a sculpture of found objects, a ritualistic shrine. But far more prevalent are contemporary materials that help dismiss notions that African artists and new media are seldom bedfellows. Digital photography, DVD projections and video are all commonly employed. Outside of "Africa Remix," local artists are also doing their bit to carry the new-media flag. Ismail Farouk, based in Johannesburg, showed delegates at the "Remix" forum his latest Web project, which uses online tools like Google mapping and the Internet photo-sharing site Flickr. He has created a digital map of the routes taken through the township of Soweto by schoolchildren and the police during the pivotal uprising of June 16, 1976. The protests, which helped change the course of South African history, turned violent and, by the end of the day, scores of children were shot dead. Users can contribute feedback via blogs and upload images and Web links to the site. Farouk has been working closely with Dr. Angel David Nieves at the University of Maryland, whose "Soweto ‘76" project is going one step further. His Web interface will offer users the chance to experience the same fateful June day through a three-dimensional reconstruction of a Soweto street while accessing archival data from the time. 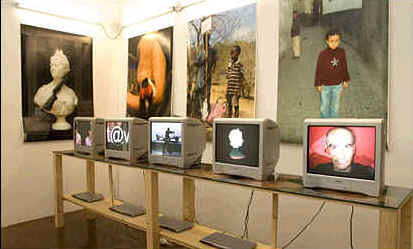 But there are significant hurdles for African artists engaged with new media. The World Wide Web is for many Africans more like “the World Wide Wait,” according to Saki Mafundikwa, founder and director of the Zimbabwe Institute of Vigital [sic] Arts, which teaches new-media skills to young people. Mafundikwa told the "Africa Remix" discussion forum that his organization battles with funds, digital connectivity and power outages. “I have had to scale back on my dreams and visions for Africa and new media. The dream is the global village, but the reality is very different,” he said. For the last news about Johannesburg Art Gallery Remix you should join our African Art Club and become an insider of the African art market.